Well… maybe… It’s not that suspicious. I entered this shop mostly out of curiosity when I noticed people disappearing as soon as they entered the door. From afar, my friend and I couldn’t see if there was any seating space and to be honest, I was already lured by the idea of eating tsukemen. As it turns out, it’s one of those noodle joints where you go down a narrow set of stairs and there’s a vendo of sorts at the entrance where you buy tickets for your meal and try to find a place to sit by the counter. The restaurant was bustling and the cook was handing out plates with giant mounds of noodles. Mounds as tall as Pharell’s hat. I’m not kidding. It was the first time N and I tried this restaurant and seeing those mounds were quite intimidating. Hence, when we bought our tickets, N opted for the medium-sized serving of the regular tsukemen while I opted for the small serving for the karai (spicy) tsukemen. N laughed when she saw my order, saying “Nagpapanggap ba?”, insinuating if I’m feigning modesty in my life choices since I’ve been living healthy in Australia. “As if,” I replied, immediately choosing the Yasubee Tokusei, the restaurant’s special side dish which includes all their toppings — charsiu, wontons, aji tamago, veggies, and nori. The food was modestly priced. We paid roughly 1080 yen for everything and were seated as comfortable as we could be in a Japanese restaurant with a small countertop. Now N and I are big girls but if we managed to have space to put down our bags, coats, and in my case, my shopping bag, then it’s all right. “Excuse me?” Is he hitting on me because I’m such a cutie pie? “You got the small serving of noodles so we usually add wontons or vegetables.” Oh. Bummer. “It’s part of the service.” Yeah. I get it. 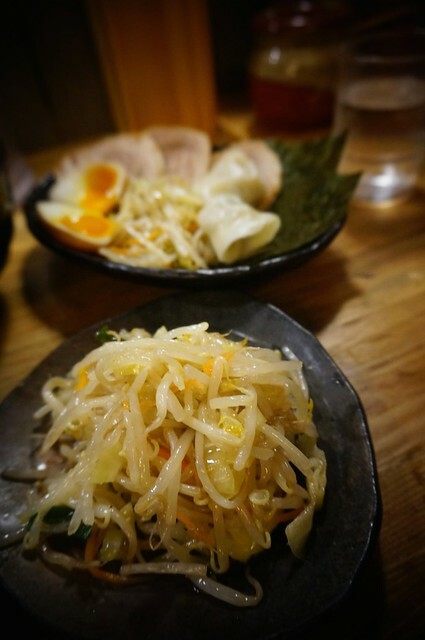 I opted to for the veggies since I noticed that they served one of my favorite side dishes, moyashi namul. Yasubee’s one of those noodle restaurants in Japan who has had a long noodle tradition (70 years long) hence they take a lot of pride in their ingredients. 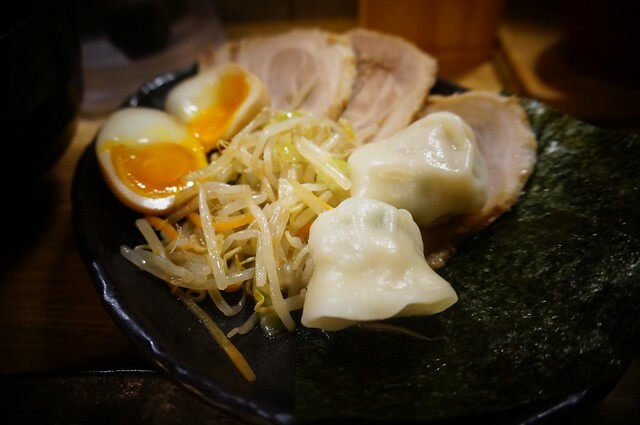 This pride is seen in their manifesto which highlights the attention they have in finding the best ingredients that they can for their reasonably priced tsukemen. They call it the Yasubee no Kodawari, Yasubee’s fastidiousness. From the flour to the sauce, everything was carefully thought of. 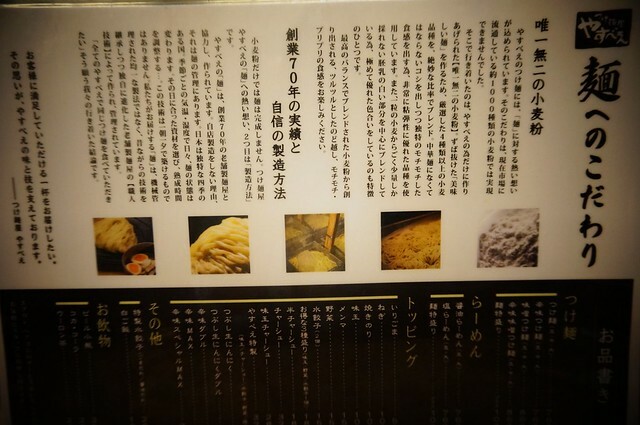 In front of the counter, apart from their menu, they have an info sheet describing how the care they placed in making their own noodles and that should you taste their noodles it should have spring when you bite and it should dance in your mouth. It’s the stuff of crazy food manga and as we waited impatiently for our food, I couldn’t help but wonder if this store was just pulling my leg. Well, the noodles did spring in my mouth as soon as I bit it but there was certainly no dancing. In fact, I was the one dancing because it turned out really good. I’m not a big fan of thick noodles and there were tsukemen restaurants in Manila who tried to sell me their authentic noodles. But none of those noodles had a life of their own. Even when I dipped the noodles in the blessedly luscious yet balanced spicy sauce, it was like eating a noodle dressed in his Sunday best. 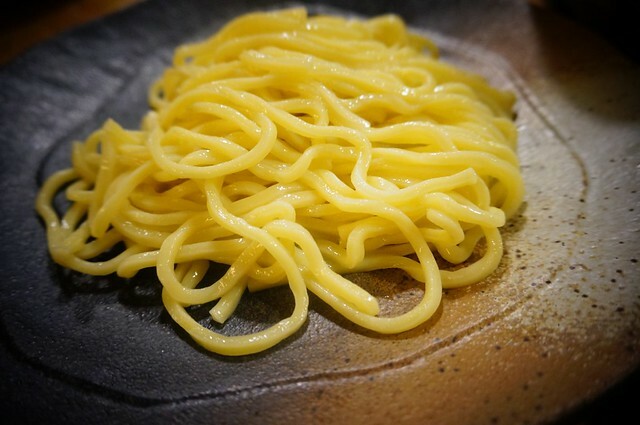 The sauce clung to the noodle and had a subtle sweetness to balance the spice, salt, and fat. It was glorious. The sides were just as delicious. The egg was perfect, the kind where the sweetness of the yolk marries with the saltiness of the soy. The charsiu also had that soy-like taste but it’s not the kind you just boil the pork in soy. In fact, it was a lot more complex, having that aniseedy sweetness, probably from five spice or star anise, enhancing the pork’s sweetnees. The wontons were fairly all right. I liked how its shaped with the intent of catching all the sauce when you dip it. 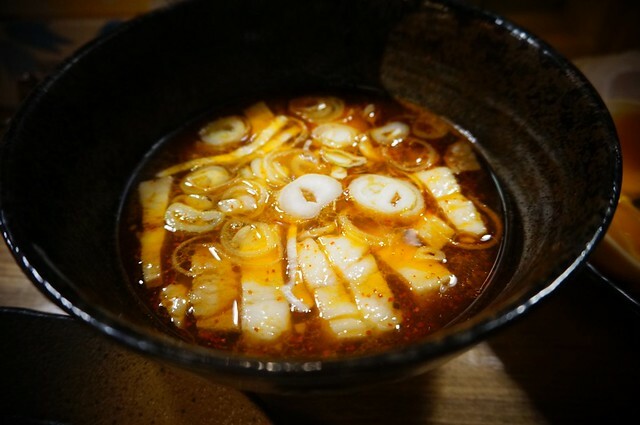 My favorite moyashi namul was also fine but it could be a little spicier. 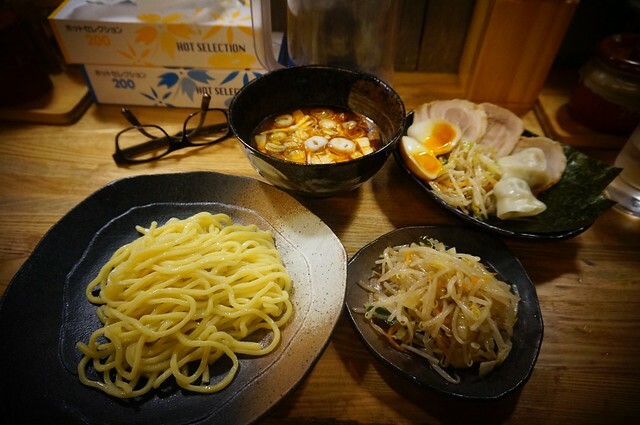 I wasn’t expecting Akiba as a place to find good eats but I really enjoyed Tsukemen Yasubee. I actually tried to eat here again but I got disoriented thanks to the new Radio Kaikan. :T Well, this shop is right next to the station so should you find yourself hungry in Akiba, here’s one place I strongly recommend. YESSSSS I REMEMBER THIS PLACE! Glorious noodles. The place looked cramped, but it was surprisingly roomy, especially our seat at the end of the counter. If I remember correctly, someone even came in with a suitcase.